With Anzac Day approaching on April 25 (a national day of remembrance in Australia and New Zealand), the thoughts of many parents, teachers and librarians will turn to books we can share with kids at this time. I'd like to recommend The Treasure Box, written by Margaret Wild, illustrated by Freya Blackwood and published by Penguin/Viking (2013). I've previously reviewed Wild's book, Vampyre and Blackwood's books, Look, a Book! and The Bicycle. But as the years go by, Peter never forgets the treasure box, and one day he returns to find it. Like most great children's picture books, The Treasure Box is the result of uniting a superb illustrator with a wonderful writer. Both Margaret Wild and Freya Blackwood are national treasures and their collaboration here is inspired. 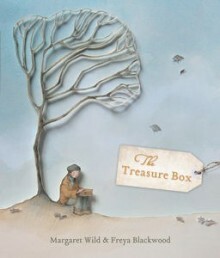 The Treasure Box is a gentle yet dramatic tale destined to become a picture book classic. I admire the way Margaret Wild has such a deft hand with serious themes in many of the children's picture books she writes. Her writing style is spare - the story is pared down to the important moments. But there is still place for descriptive language to engage our reader senses, and phrases that remain in our minds long after the book is finished - if indeed, a book is ever "finished"? Blackwood's illustration style is intriguing. The pages of the treasured book become backdrops for some pages, and burnt snippets rain down from the sky in a hauntingly beautiful collaged war scene. Endpapers reinforce this message of survival despite destruction. The Treasure Box is a wonderful children's picture book for teachers wanting to explore themes of immigration, war or values. Students will be prompted to think about what they hold dear, and how far they would go to keep their treasures safe. I love the book's positive message about the triumph of education over ignorance, and the survival of the human spirit. Because of Blackwood's inclusion of newspaper fragments in the illustrations, this would be an excellent opportunity to explore Newspaper Blackout poetry with kids. Read more about it at Austin Kleon's website, or check out the way Caroline Lennox applied it with her class. If you'd like to explore collage as an art technique with your kids, this Pinterest board has some interesting examples. You'll find another review of The Treasure Box with some excellent learning activities at Children's Books Daily. Next Wednesday, I'll have another Anzac-themed review for you: An Anzac Tale by Ruth Starke and Greg Holfield. Very interesting selection...also possible to use for Earth Day on April 22. Encourages child to really "think" on the story! Also there are so many ways to connect with other themes in the classroom or for discussion at home.